An own apartment through a housing cooperative – the best thing we have done! We have met Elaine and her daughter Pia in Pia’s home. Elaine tells us about how they decided to start a housing cooperative and gives some advice to new parents in similar situations. – As a baby Pia had a pretty normal development curve during her first year. It was when she was ine and a half years old and still hadn’t started to walk that we went to the hospital for a first consideration. This was in 1972. It turned out that she had to stay at the hospital for five days and all in all there were ten doctors involved. – The last day was a Friday and we were ready to go home. It just seemed like they hadn’t found anything special. And then suddenly we got the notice that the tests had shown a very severe metabolic disorder. The doctors spoke about a disease which would make her weaker – and they couldn’t tell if she was going to survive. From this moment it took nine years until Pia got the diagnosis Retts syndrome. Retts syndrome is a very unusual diagnosis and it only affects women. It is a progressive disease which often makes the person weaker in cause of time. However, the senses, like sight and hearing are not affected. Pia has limitations in how much she can use speech to express herself, and today she uses eye contact and face expressions as her main communication means. Other people can express empathy for your situation, but they can never fully understand what it is really like to be a parent to a child with an intellectual disability. – During this time I got involved in the Swedish association FUB (The Swedish National Association for Persons with Intellectual Disability) – and I found it great to get to know other parents through this involvement. Together with them I could share both big and small things in life. Other people can express empathy for your situation, but they can never fully understand what it is really like to be a parent to a child with an intellectual disability. Elaine’s involvement started to take more and more of her time, and during the 1990’s she spent many years as a very active member on both regional, national and international levels. She was the chairman of the board of FUB for many years and today she is still very active. Right now she is chairman of the board of FUB and HSO in Western Sweden. – I got home one day and told my husband that I thought Pia was ready to move to a house of her own now! She was 23 years old at that time, and he wasn’t so sure as I was when I told him this for the first time. But I had an idea about how we could arrange a housing where she would get both the social life with friends as well as the individual support she needed. 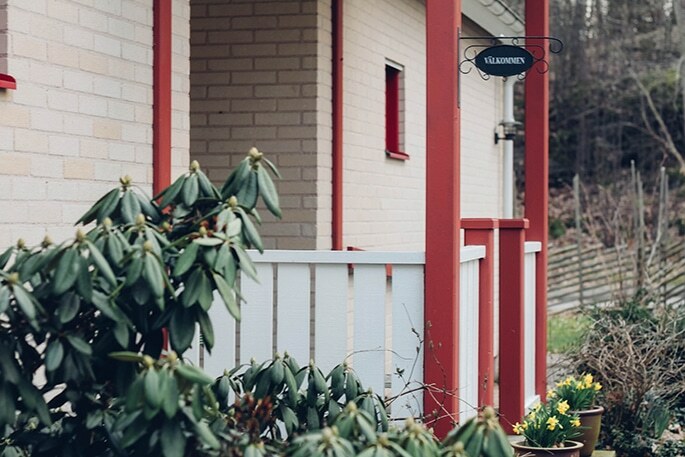 This idea turned out to be the start of the first housing cooperative for people with disabilities in Sweden ever. Elaine and her husband found three other families who were interested in starting a cooperative for their children together and after a long process of dialogue meetings together with different representatives from the municipality where they lived they finally reached their goal. – Pia really likes her own home. She has her friends here at the same place so they can have social activities together, and they have a wonderful garden and a workshop where some of them go to work during daytime as well. And Pia really likes to be in her living room and listen to music. All of a sudden ABBA is playing on the stereo and there is no doubt about that ABBA is one of Pia’s favorite music groups. Elaine continues to tell us that another thing Pia really likes is to go travelling. She has been to Cyprus and Mallorca several times, and this year she will go to Croatia for some holiday. You don’t need to know a specific language to connect with parents in other countries. It’s just magic. Thanks to Elaine’s big enthusiasm and involvement in associations she has travelled a lot and visited many countries as well. She tells about some very tough experiences from journeys to Romania and Russia but also about inspiring visits to New Zeeland for example. Today she travels a lot to Japan where she gives lectures about the development and legislation in Sweden within the disability area. – You don’t need to know a specific language to connect with parents in other countries, says Elaine. It’s just magic. – You need to have a very clear vision of what you want when you speak to representatives from authorities. If you are in a meeting and you don’t know how to answer a question – tell them that you’ll go home and think about it and come back with your answer later. It is always so much more difficult to change things once they are set. – As long as I know that I have the body and mind to speak for Pia and for her will I know she will have a good life, says Elaine while we are finishing our session together.